Pilot Recruitment Information: Zest Airways, Inc.
General Information: Zest Airways, Inc.
NotesFormerly known as Asian Spirit. Join the most refreshing Airline as Line Captains and First Officers! 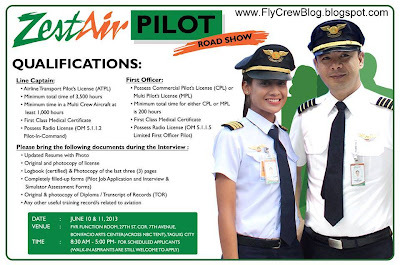 Be part of ZestAir’s Pilot Roadshow 2013! Our recruitment flyer AirAsia Thailand. Pilot Job: Eva Air A321First Officer. Pilot Job: Garuda Indonesia ATR72 First Officer.